Be part of one of the favorite areas in Rapallo, THE ENCLAVE. The Enclave is made up of 90 coach homes surrounding the pool and Lake House with catering kitchen, and gas grills, you literally walk outside your door and over to the pool. Just a short walk to the Coconut Point Mall. 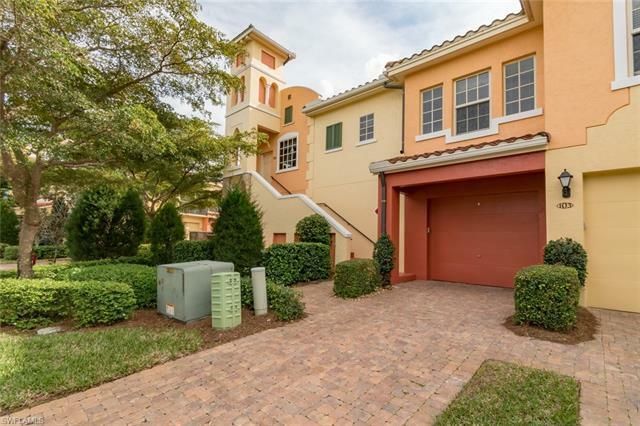 This second floor Chivari Model is known for being light and bright, windows in every room with a Juliette Balcony off the Master bedroom and a screened Lanai overlooking lake with the desired southern exposure. This open floorplan is tastefully decorated, and painted in soothing colors with crown molding in the living area and being offered TURNKEY FURNISHED. Rapallo is a Mediterranean style resort community known for all the fabulous amenities such as, two lagoon style pools with rock grotto waterfalls and spa. Screened jr Olympic lap pool, fitness center with full time fitness director, 5 har tru tennis courts, full time tennis pro, clubhouse with full catering kitchen, library, full time activity Director, Yoga studio, bocce ball, fishing piers, jogging and walking paths, and again walk to the Coconut point Mall with over 25 restaurants, theater, specialty stores, just 12 miles to airport.